If altruism is “selfishness in reverse” (Myers, 2012, p. 386) then the story of David and Mephibosheth is a fitting biblical example. The arc of this story is found in 2 Samuel 9. David is now king, Saul his predecessor/tormenter is now dead, Saul’s son, Jonathan (David’s dear friend), is dead, and David is now free to establish his rule. At this point, most kings would enact justice against his enemies, friends of enemies….and family of enemies. David was not most kings, for he showed kindness to Saul’s family because of Jonathan. Because of this desire for altruism, a crippled man, named Mephibosheth, is brought before David. In 2 Samuel 4:1-4, we read of how Mephibosheth came to be crippled in both feet. When Mephibosheth was five years old, news of war came to the attention of his nurse. The nurse grabbed Mephibosheth, and in her rush, dropped him. It must have been a long or hard fall because this accident permanently disabled young Mephibosheth. He was handicapped for the rest of his life, both of his feet became irreparably damaged. This account is a good example of the carelessness of adults causing permanent damage to a child. Though the Bible does not say, the word which came to Mephibosheth concerning the King’s demand of his presence, must have frightened him. In 2 Samuel 4:4, David asked for the whereabouts of Mephibosheth. Could it be Mephibosheth was in hiding or living in seclusion? (Quest, 2011, Kindle location 92,949). In verse seven David tells Mephibosheth not to be afraid. In verse eight, Mephibosheth even refers to himself as “a dead dog”. In 2 Samuel 19:28 Mephipbosheth says to David (long after the altruistic gesture) “All my grandfather’s descendants deserved nothing but death from my lord the king, but you gave your servant a place among those who eat at your table.” These verses, and the cultural ones of the day mentioned in the introduction, clue us in to the high probability of fear on the part of Mephibosheth. David meets Mephibosheth with great joy and “At your service” is Mephibosheth’s reply (vs. 6). In verse seven, David offers three things: kindness, restoration, and the promise of his presence to Mephibosheth. Mephibosheth would now eat at the king’s table, a very great honor, for the rest of his life. David’s contemporaries would have perhaps rooted out all of Saul’s descendants. King David showed true altruism in the love shown to Saul’s crippled grandson. Social psychology principle one: Why did David help? This was altruism at its purest. David could receive nothing in return from Mephibosheth. If one considers the social-exchange theory, there would be very little benefit for David personally. David was motivated by doing what pleased God. Was it reciprocity norm? Again, Mephibosheth could not bless David in return, so no. Perhaps it would be social-responsibility norm. David blessed Mephibosheth and did not expect the same in return. It can be argued David’s heart-after-God approach to all he did (see 1 Samuel 13:14) superseded even social- responsibility to what we could call Divine-responsibility. Social psychology principle two: When Did David help? help” (Myers, 2012, p. 388). It is not known exactly how many witnessed the kindness of David to Mephibosheth. In 2 Samuel 8:15-18, we read of many under David’s authority. “David reigned over all Israel…Joab…was over the army; Jehoshaphat…was recorder; Zadok…and Ahimelek were priests; Seraiah was secretary; Benaiah..was over the Kerethites and Pelethites; and David’s sons were priests. (2 Samuel 8:15-18 NIV). The biblical text goes immediately from this list into the story of David and Mephibosheth, and it would not be wise to read it as perfectly sequential. In 2 Samuel nine we do read of Ziba, who would later become Mephibosheth’s servant as well. David did not show kindness to Mephibosheth because of bystanders. There was also no one else who could have done what David did for him. If one were to interpret David’s actions using the Latane and Darley’s decision tree (Myers, 2011, p. 389), it may be assumed David did notice the incident (asked for anyone in Saul’s family), interpreted it as an emergency (asked for Mephibosheth as soon as he heard of him), assumed responsibility (met Mephibosheth personally and pledged kindness), and tried to help (kept his promise to Mephibosheth). It is difficult do know exactly what David knew at the time. The passage seems to indicate David met Mephibosheth for the first time 2 Samuel nine. There is little doubt, however, David interpreted Mephibosheth’s plight realistically. Mephibosheth was indeed a cripple and would need assistance. 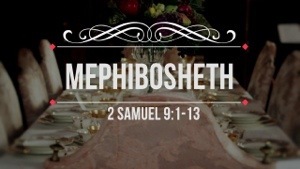 In one fell swoop, Mephibosheth went from castaway to kings’ table! King David went against the grain concerning other rulers of his day. Perhaps Mephibosheth would have been an easy target for their wrath, he could not run like other enemies. David refused to eradicate the house of Saul, instead, he showed lovingkindness to those, whom perhaps, even hated him. Because of David’s pure altruism, we now have a story written for the ages, which illustrates God’s unwavering love for all people, crippled and undeserving as we may be. Quest study Bible: New International Version. (2011). Grand Rapids, MI: Zondervan.